Deirdre O’CallaghanPredictability typically carries negative connotations in the context of art, but in the case of The National, it’s more about promises kept. For the third May in six years, following Boxer in 2007 and High Violet in 2010 – and though Alligator came out in April 2005 but I bought it in June, averaging out to May – they’ve released a sterling new album in Trouble Will Find Me. 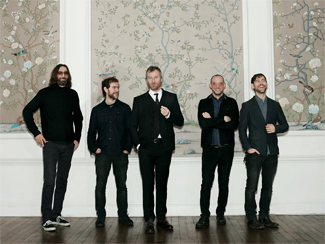 It’s not a record that breaks any new ground for the band – Matt Berninger’s sonorous baritone and oblique lyrics, the Dessners’ twin-terwining guitar parts, the Devendorf brothers’ complex yet effortless rhythm section combining for another collection of gleaming melancholic rock – but achieves maybe the more difficult feat of arguably keeping the band at the top of their game for a third or fourth straight record, depending on your personal grading curve. My own personal bias for the band is documented throughout the last eight years or so of this blog, but I’ll tell you this – there’s a real comfort in being confident that a band has released one of your very favourite records of the year before even hearing a note of it. Trouble Will Find Me is out next Tuesday, May 21, and was made available to stream in advance yesterday afternoon via iTunes. There’s feature interviews with the band at The Guardian and The Line Of Best Fit, and last week they took part in a Reddit AMA (which Consequence Of Sound has helpfully summarized) in which they released a new video, the inspiration for which was tracked down by Twenty-Four Bit. The National headline a free show at Yonge-Dundas Square on June 14 as part of NXNE. Happy to see Superchunk aren’t taking another ten years between records; they’ll release I Hate Music on August 20; details and non-Toronto-including tour dates can be had at Merge, album trailer below. And more happiness for folks who dug indie rock when it was still called college rock – Exclaim reports that Sebadoh will put out a new record later this year entitled Defend Yourself. Specifics are still forthcoming, but Lou Barlow announced it via Instagram so it must be true. The Daily Swarm and The Independent talk to Wayne Coyne and Jambands to Steven Drozd, both of The Flaming Lips. And for whatever reason, the band have released a live video of themselves covering David Bowie’s “Heroes”, and even with all the echo on his vocals, Coyne arguably sounds better than he has in some time. The Village Voice talks to Benjamin Michael Lerner of Telekinesis, who premiered a new video from Domarion at NPR last week. NPR has a World Cafe session and Dallas News an interview with Jim James.